Tigers are the largest members of the cat family. Their coat is orange with black stripes; however, color intensity and the pattern of markings can vary according to species. 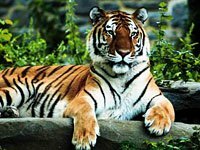 The Sumatran tiger is the smallest and darkest of the subspecies, and the Siberian is the largest and lightest in color. 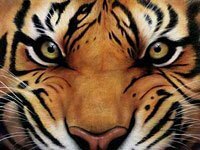 No two tigers are exactly alike. 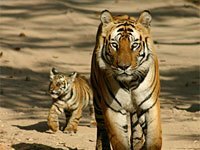 Although critically endangered, wild tigers still prowl the border of India and Bangladesh, one of the most densely populated places on earth; the western Terai of India and Nepal; the untamed borderlands of Vietnam, Laos and Cambodia; and the vast boreal forests of the Russian Far East. Tigers live in several types of environments, including forests, wetlands, and grasslands, but regardless of their surroundings, they use their stripes as the ultimate camouflage. Normally dark brown or black, these markings cover tigers from head to toe and allow them to become nearly invisible when hunting and stalking their prey. The tiger is a night hunter and can easily take down large animals, such as deer, wild pigs and cattle. Small animals are also sometimes on the menu. Tigers can eat up to 90 pounds in a single sitting. After a big meal, they don't have to eat again for up to two weeks. How many subspecies of tiger used to live on the planet? One thing for sure is that a century ago there were eight subspecies of tiger, all native to Asia. Now there are only five: The 1980s saw the last of the fearsome Javan tiger, a 250-pound animal that could take down 2,000-pound bulls. The Caspian tiger went extinct in the 1970s. And the last Bali tiger probably died in the 1940s. 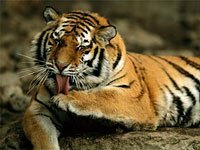 The South China tiger was recently declared extinct in the wild by tiger researcher Ron Tilson, conservation director at the Minnesota Zoo. Also known as the Siberian or Manchurian tiger, the Amur is the largest of the great cats. The Bengal is the most numerous tiger subspecies, with 3,250 to 4,700 tigers remaining in the wild. Fewer than 1,500 Indochinese tigers remain in Thailand and surrounding countries. The last of the island tigers, this cat is generally smaller than mainland tigers. While most cats despise water, tigers love taking baths to help keep themselves cool during the hottest parts of the day. They’ll submerge themselves in nearby lakes and streams, soaking for up to an hour, but neck deep only. 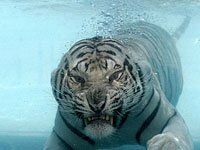 Tigers don’t like getting water in their eyes, to the point that they’ll actually enter the water backwards to prevent this from happening. Once they return to dry land, the combination of the wetness and the wind has a pleasant cooling effect on the tiger’s body and if it starts to wear off, no problem – they just repeat the process. And thanks to their webbed feet, tigers are also powerful swimmers, and have been known to cover up to 20 miles in a single outing! Did you know this about tigers? In 2004, the Malayan tiger was identified as a tiger subspecies. 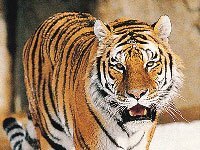 The number of living subspecies, however, will likely remain at five with the recent extinction of the South China tiger. Other extinct subspecies include the Caspian, Javan and Balinese tigers. The tiger's ability to adapt to a variety of habitats isn't enough to save it from extinction; it requires large, contiguous areas of habitat and lives in some of the most densely populated places on earth. The earliest known fossils of true tigers, dating to around 1.7 million years ago, come from the island of Java in Indonesia, suggesting that the cat evolved there before radiating out. Download free Tiger wallpapers, click on the image to open the large version. Print free Tiger coloring pages, click on the image to open the large version.